AMMAN - Seen as up and coming superpower, China seems to elicit the attention of Jordanians in an assortment of fields. 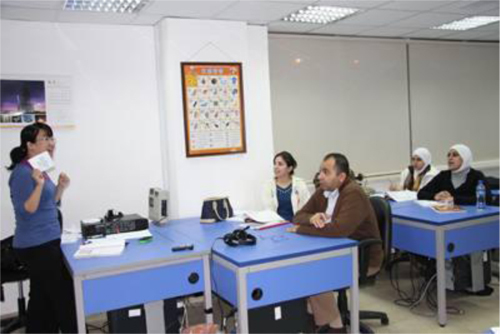 Believing that language is the key to understanding a nation, Jordanians are showing more eagerness to learn Chinese at the several centers that have opened in the past few years. Each has his reasons, but business considerations seem to prevail. "For me as a trader, speaking Chinese helps me get better deals. The trader who does not have business with China nowadays is not a successful trader," Khalid Ashi, general manager of Petra Textiles Establishment, said Sunday. Cultural counsellor at the Chinese embassy in Amman, Lai Wan Zhu, seems to agree. "Political and economic ties between China and the Arab world are growing and we have seen a rise in the number of people studying Chinese in this region and elsewhere,” Lai said in a recent interview with The Jordan Times. According to Lai, there are 20,000 Arab traders who have set up commercial offices in China. Interest in learning Chinese started almost 10 years ago, when trade relations with the Arab world started to boom, according to the diplomat. The total trade volume between China and the 22 Arab states grew from $15.2 billion in 2000 to $108 billion in 2009 - an increase of 611 per cent over the decade or an average annual growth rate of 24.3 per cent. The total trade volume between China and Jordan amounted to $2.08 billion in 2009, an increase of 6.6 per cent over the previous year, according to statistics provided by Chinese customs. With increased interest across the world in learning Chinese, the Chinese government started supporting the teaching of Chinese to non-native speakers both in China and abroad, said Lai, who added that there are currently more than 280 Confucius institutes - nonprofit institutions that teach Chinese language and culture - in the four corners of the globe. The Arab world saw its first Confucius institutes open almost five years ago, and there are now two in Egypt, one in Lebanon, one in Morocco, one in Tunisia and one in Jordan. In addition, Chinese is taught at several universities in Arab countries including Kuwait, Egypt and Jordan, said Lai. Mohammad Sami Al Kharouf, manager of the Talal Abu Ghazaleh Confucius Institute, said that for traders dealing with Chinese suppliers, “it is a must to learn the language”. But not all study Chinese to serve their business interests. Some want to study Chinese as they say it opens a window to an ancient and deep-rooted culture. Others say learning Chinese is good exercise for their brains. “Chinese is one of the most ancient languages in the whole world. China, its people and the language are very interesting to me. I study Chinese as I want to study their literature,” Nadiyya Al Zgheibi, a student at the TAG-Confucius Institute in Amman, said. Zgheibi went to China to study the language from 1997-1999 after she obtained a scholarship from the Chinese higher education ministry, but did not complete the course for health reasons. She has had a second chance “to fulfil my life dream” at the Confucius Institute. “I have an ambition to translate Chinese literature into Arabic as it holds many noble meanings,” said Zgheibi, who also believes that the language “stimulates the brain”. For some others, learning Chinese could open a door for employment. Mustafa Al Share, who currently studies Chinese language and literature at Shenyang Normal University, highlighted the “huge” potential for cultural exchange. In addition to the strong chances of getting a job as a translator, the student said that “speaking the language can help me promote Jordan and better understanding between our and their civilisations”. Farah Ismael, a junior at the Amman Private University majoring in translation,　agreed that the opportunity opens doors career-wise. “When I speak Chinese, I will make use of it in my work maybe as a translator. Finding a job will be easy, especially since there are several Chinese companies working in Jordan,” Ismael, who also studies at the TAG-Confucius Institute said. “There is a huge potential for those who study Chinese to work, especially in the field of tourism and working as interpreters and guides. It is also important for conducting business,” said Lai. Ismael’s relative Sali Bairuti is only in eighth grade but shares her dream. Both are encouraged by their families, like other youth enrolled in the institute. Twelve-year-old Alexander Rabadi has been studying Chinese for the past eight months, encouraged by his mother, Reem, a linguist at the German-Jordanian University. She wants him to be “exposed to a great and different culture and learn the language of a country that is on track to becoming a superpower”, he said. According to Kharouf, the TAG-Confucius Institute has so far graduated some 600-700 students with different levels of skill in Chinese and currently has 60 students. Chinese, which has about 10,000 characters, is not easy to learn, says Ke Zhu, a Chinese language teacher at the military language institute in Jordan who is training military personnel of all ranks in speaking Chinese. “I focus a lot on listening and speaking skills for my students as the language is not easy to learn,” she said. Professor You agreed, saying that even native Chinese speakers do not know all the characters. “Obtaining two to three thousand characters is enough to be able to have basic Chinese communication, and that takes one year of intensive study and exercise,” said the professor. According to the embassy in Amman, there are about 1.3 billion people in China, while the language is also spoken by about 200 million people in Malaysia, Singapore, Indonesia, Vietnam and South Korea. There are seven official dialects and dozens of sub-dialects, but among the official dialects, Mandarin is the most commonly understood and taught. Lai added that there are plans to open a centre for teaching Chinese to guides in Amman to provide Chinese tourists with guides who speak their language will help promote tourism. In addition to teaching the language, the Talal Abu Ghazaleh Group is planning to open a centre to educate Jordanians on the various aspects of Chinese culture, Kharouf said. It will be open before the end of the year and will be open to the public at no charge, he said, adding that the centre will showcase Chinese culture, food and folklore, as well as Chinese discoveries, thinkers and writers.